New, longer-term research confirms the continuing safety and effectiveness of Namenda for the treatment of moderate to severe Alzheimer’s disease; the drug may slow the progression of the illness for at least a year. Namenda, which goes by the generic name memantine, was approved by the Food and Drug Administration in 2003 for the treatment of the more advanced stages of Alzheimer’s disease and is used by millions of Alzheimer’s patients worldwide. Barry Reisberg, M.D., director of the Zachary and Elizabeth M. Fisher Alzheimer’s Disease Education and Resources Program at New York University Medical Center, and colleagues, conducted a 24-week extension trial of the drug. In this continuation study, participants who had previously been part of a double-blind study in which some were taking the active drug and some were taking a dummy pillwere now all given the active drug. For this extension study, 175 patients with moderate to severe Alzheimer’s disease who completed the previous 28-week study, all received 20 mg of memantine daily for an additional 24 weeks. The researchers report that during the extended study, the patients, all of whom had moderate to severe Alzheimer’s, did not deteriorate as quickly when taking memantine. Caregivers also reported that Namenda was beneficial in terms of people’s ability to function, and the drug did not have a high rate of side effects. These results were consistent with earlier findings that Namenda offers benefit for those in the more advanced stages of Alzheimer’s. “These new data from Reisberg and coworkers provide additional reassurance to prescribing physicians that long-term use of memantine is safe, continues to have a low rate of adverse effects, and may have continuing beneficial clinical effects,” writes Jeffrey L. Cummings, M.D., of the University of California, Los Angeles in an editorial accompanying the new study. The later stages of Alzheimer’s disease are a particularly stressful time for families and patients. Patients become increasingly unable to wash, bathe, and care for themselves. Other approved Alzheimer’s drugs, such as Aricept, Exelon, and Razadyne, are not presently approved for the treatment of the more advanced stages of Alzheimer’s disease. Memantine offers hope for millions with the disease to remain independent longer, easing the burden on caregivers. The low side effect rates were similar to those reported in earlier studies. It is important to remember that Namenda, like other drugs approved for the treatment of Alzheimer’s disease, may ease symptoms and slow mental deterioration but does not stop the progressive long-term downward course of the disease. (See the article, “Breakthrough Drug Offers New Hope for Alzheimer’s“.) Some studies suggest Namenda may also have benefits for those in the milder stages of Alzheimer’s as well, but more research is needed to determine the significance of the drug’s beneficial effects in mild Alzheimer’s. Another study is looking at whether people who are taking Namenda for Alzheimer’s disease may benefit additionally from a comprehensive, individualized program of caregiving. This study at New York University, which is funded in part by the Fisher Center for Alzheimer’s Research Foundation, is currently recruiting patients. [See the alzinfo.org story, “New Study to Examine Effects of Namenda and Caregiving for Alzheimer’s” ] People with Alzheimer’s who qualify for the trial will receive Namenda at no charge, as well as free follow-up medical evaluations. In addition, some study participants will receive an individualized caregiving program consisting in part of home visits to get the patient exercising, doing enjoyable activities and cognitive stimulation, with educational sessions for caregivers on coping with difficult situations, and a caregiver support group to help with questions and emotional support. To learn more, contact Robyn Waters at 212-263-8088. Dr. Reisberg’s work has been pivotal in the development of all three current pharmaceutical treatment modalities for Alzheimer’s. His rating scales and descriptions of the nature and course of Alzheimer’s are widely used throughout the world. The current study appeared in the January 9 issue of the Archives of Neurology, a medical journal published by the American Medical Association. For more on the latest news on treatments for Alzheimer’s disease, visit www.alzinfo.org, the Alzheimer’s Information Site. By www.ALZinfo.org, The Alzheimer’s Information Site. 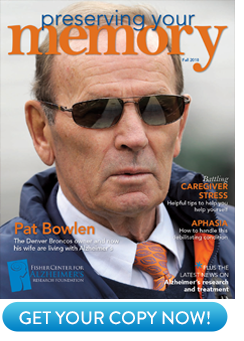 Reviewed by Dr. Sunnie Kenowsky, Advisory Board Member, Fisher Center for Alzheimer’s Research Foundation. Barry Reisberg; Rachelle Doody; Albrecht Stöffler; Frederick Schmitt; Steven Ferris; Hans Jörg Möbius: “A 24-Week Open-Label Extension Study of Memantine in Moderate to Severe Alzheimer Disease.” Archives of Neurology, Volume 63, pages 49-54, January 9, 2006. Jeffrey L. Cummings: “What We Can Learn From Open-Label Extensions of Randomized Clinical Trials.” Archives of Neurology, Volume 63, pages 18-19, January 9, 2006.